Notable features Tide locked world around red dwarf, in orbit around white dwarf. Whum is tide locked in orbit around a red dwarf star, named Fvuu. Like all such worlds, one side is locked in permanent darkness, covered with vast sheets of ice. The dayside sports an immense cyclonic storm centered at the sub-stellar point, constantly whirling and boiling with atmospheric violence, hurricane-force winds, lashing rain, and great arcs of lightning. The habitable area is in the narrow ribbon of real estate receiving only glancing sunlight, as if in perpetual sunset, where the weather is mild and warm enough to sustain life. As one approaches the terminator, the climate becomes more and more chill until one encounters the vast wall of ice signalling the end of habitable territory. Go the other way, and the weather becomes windier and warmer, culminating in howling gales and permanent roiling cloudy skies lit by flickering lightning. Fvuu itself is in orbit around a more massive body, a white dwarf, the corpse of an ancient star that long ago shed its outer layers before slowly falling in on itself into a sphere crushed so dense by its own gravity that the electrons separate from the atoms and flow freely in a bizarre form of matter known as a degenerate gas. This remnant, still fiercely glowing blue-white hot from the leftover heat of the old stellar core, is easily visible from Whum's dayside in clear weather. The cast-off layers of the old star form what is called a planetary nebula, although the shell of gas has nothing to do with actual planets, an ionized cloud of hydrogen and helium roughly a light year across. Those who venture onto the night side can see the knotted, twisted ring of vapors with glowing filaments extending away from it arcing across the sky. Fvuu casts a yellowish light. The lack of blue-spectrum light makes the sky, when clear, dark and greenish in color. Many of the brighter stars and planets in Whum's system can be seen even in the day. The frequent solar storms lead to regular auroras dancing across the heavens. When initially discovered, Whum lacked significant complex life forms due to the near-total mass extinction that occurred when Fvuu's companion star passed through its red giant phase and left only extremophile microbes in its wake. The settlers stepped up to fill in the gap. 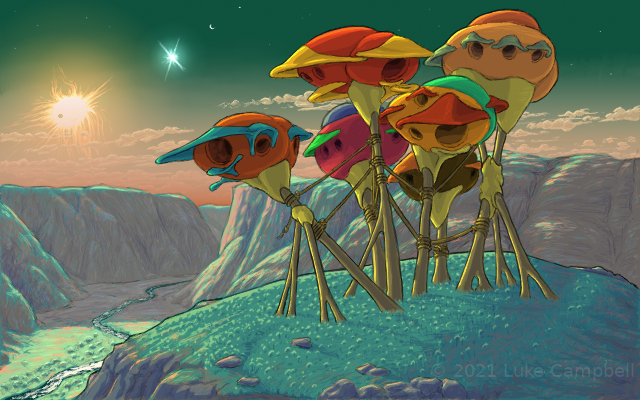 Large expanses of Whum are now covered in the blue-green vegetation from the Tweechi homeworld, with the occasional patch of dark purple from the Pirang's native planet or the red-and-orange-and-yellow of life native to Gummiland. The fauna is likewise largely introduced, forming a blended ecosystem that is still sorting out how it should all fit together. Whum's first settlements were primarily made up of Gummi homesteaders. When word spread of the new world's conditions, however, it began attracting more and more Tweechi colonists. Soon, the Tweechi outnumbered the Gummis by a significant margin. Tweechis being who they are, there is a long history of feuds and conflicts between flocks. The most notorious of these was the thousand flock war, where a dispute over boundaries between vase flower farms ran out of control. After the dust settled and the dead were buried, reforms were instituted to make these kinds of conflicts less frequent leading to Whum's current system of government. Tweechis naturally form flocks, and different flocks tend to squabble. With the Gummi's moderating influence, the Tweechis of Whum came up with methods that prevent the planet from degenerating into permanent flock-on-flock warfare. All the flocks in a given area will have a meeting place, where they come to discuss policy and settle grievances. All of the Tweechis in the area can join in, and discussions often get boisterous. Usually, after enough talking, the assembled flocks will come to something like a consensus and act on it. Each flock is able to choose a delegate from among their number to speak on their behalf at the next level of organization, the regional assembly. And each region will choose an elder statesman (or states-thing, at any rate), to speak for the region at the planetary assembly. The assemblies do not have any formal enforcement power in the form of armies or police, but they give legitimacy and social sanction. Those who buck the will of an assembly may find themselves on the wrong side of all the other flocks who support the assembly. Non-Tweechi are welcome to attend the local assembly for the place that they live, and Gummi and Pirang communities select delegates from among their number for the regional assemblies. The Gummis have coordination committees which work in parallel with the assemblies, having significant influence among the Gummis of Whum but relatively little among the Tweechi majority. Non-Tweechi residents are often in high demand as mediators and go-betweens to smooth out inadvertent insults and ruffled feathers. Elguvhii is located in and along the sides of a river valley, where melt-water from advancing glaciers off of the night-side ice sheet form swift torrents of icy cold water. The air is typically cool from the chilled air pouring off the ice sheet in steady winds flowing in the direction of the sub-stellar pole. Most of the city's dwellings are built up on the cliff sides, as groups of nests for each flock separated by just enough room to keep tempers from boiling over. The more prestigious and wealthy flocks occupy the higher spots on the cliff face. The city's Pirang minority have their quarters on the valley floor. The Gummis build their homes in either location, often in the no-man's-land between flocks where they are tolerated and even welcomed as mediators and peace-keepers. Elguvhii is not a large city. Most of its business revolves around trade, transportation, and services to travelers due to the wormhole connections passing through it. The wormhole station is conveniently located on flat ground, as are most businesses that deal with outsiders.